This is really pretty, Lucy! The key makes it such a special card! Love this, Lucy, and especially the repeated houses for the background......going to try that using those line of marching children.......thank you! 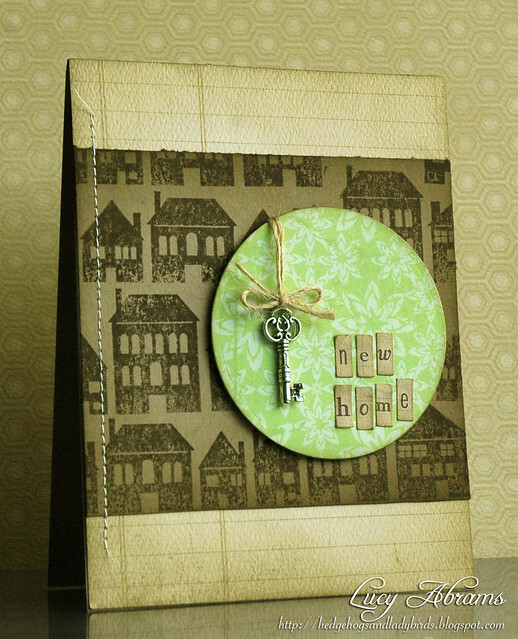 I know what you mean that you were "determined" to use up the scrap piece...this works so beautifully with the vintag-y colors! Absolutely fab! This is simply gorgeous Lucy! I love the colours and that little key charm! I like that circle of green with the rest of the card. Great card. Love that adorable little key, it adds so much to the card! And the tiny little alpha letters are too cute! What a beautiful, rustic, card. I LOVE it, Lucy.